Please note that you will receive push notifications using the mobile and tablet apps and for desktop versions you will receive web notifications. You can set your preferences via the applications privacy settings. By completing the form below and continuing to use the service you agree with the use of your personal information as detailed in the Policy. The One Financial Markets News Desk+ is a FREE premium financial news channel offering traders all the breaking financial and political news from around the world. This service is ideal for both new and experienced traders who want a technical yet rounded view on the markets, but with the extra heads up from the bank's trading desks. Our growing team of analysts have decades of experience in the forex markets and understand the challenges involved in becoming a successful trader. Available via desktop and as an app in the App store, the One Financial Markets News Desk+ app is the first of it's kind. This service is brought to you by One Financial Markets. All content is provided by Trading Central and Dealer-insight.com with the exception of Trading Academy and One Financial Markets promotions. One Financial Markets is not involved in any Trading Central and Dealer-insight.com content production, provision, commentary, news feeds or any other information, whether live or archived. By using this service, you expressly disclaim all liability for any claim for damages, financial or otherwise, against One Financial Markets resulting from the use or interpretation of information provided through this website and service, both online and through this mobile/desktop application. Any opinions expressed through this mobile/desktop application are solely for general market information, commentary and educational purposes and do not constitute investment advice in any way. One Financial Markets expressly disclaims all liability from actions or transactions arising out of the usage of this content, both video and audio. By using our services, you expressly agree to hold One Financial Markets harmless against any claims whatsoever and confirm that your actions are at your sole discretion and risk. Forex trading and margin trading carries a high level of risk and may not be suitable for all investors. It could also result in losses equalling to or exceeding your initial investment. Before deciding to invest in forex trading or margin trading, you should carefully consider your investment objectives, level of experience and risk appetite. You are strongly advised to carry out your own research and seek independent financial advice before making any trading decisions. 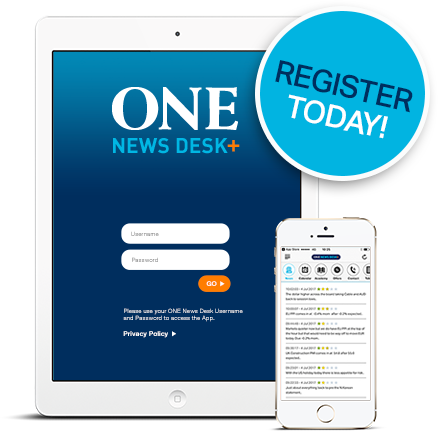 HAVE QUESTIONS ABOUT OUR ONE NEWS DESK+ APP?